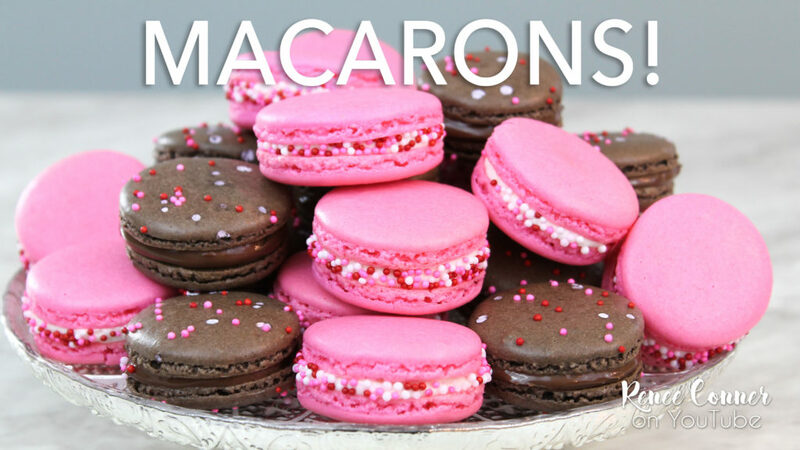 Macarons are sweet little cookies, they’ve caught on and aren’t going anywhere. 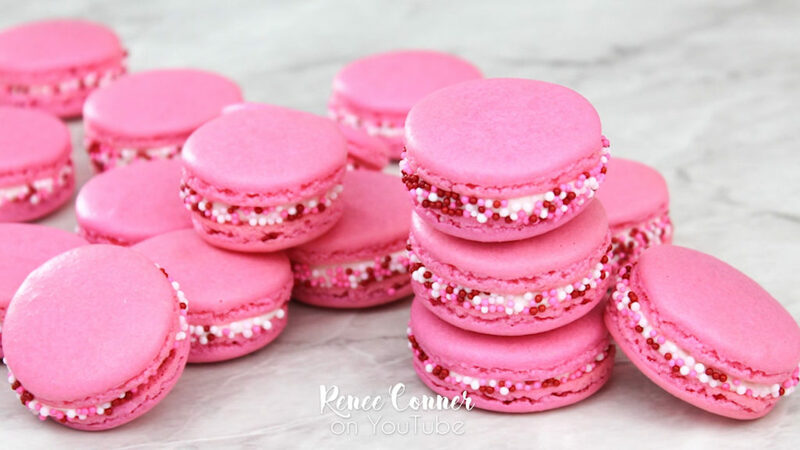 They are pretty, delicious and easy to make. You can get them (or better yet make them) in a huge variety of flavors, limited only by your imagination. But first, you have to start with a good base. 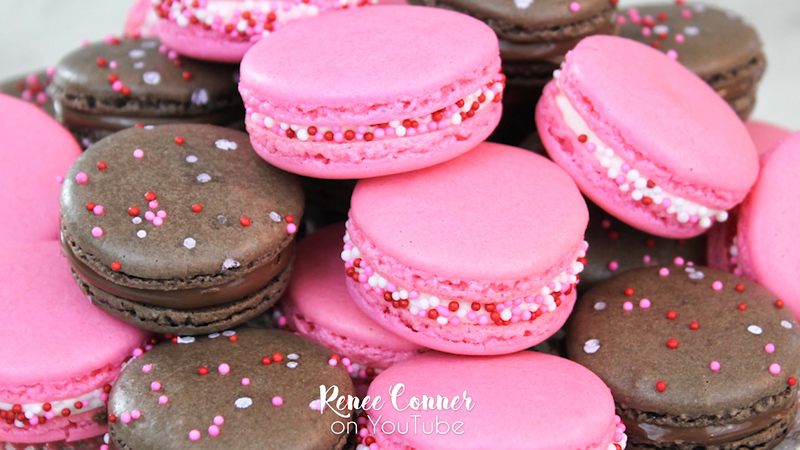 Read on for my recipe for Vanilla Macarons and a variation to make them Chocolate Macarons! 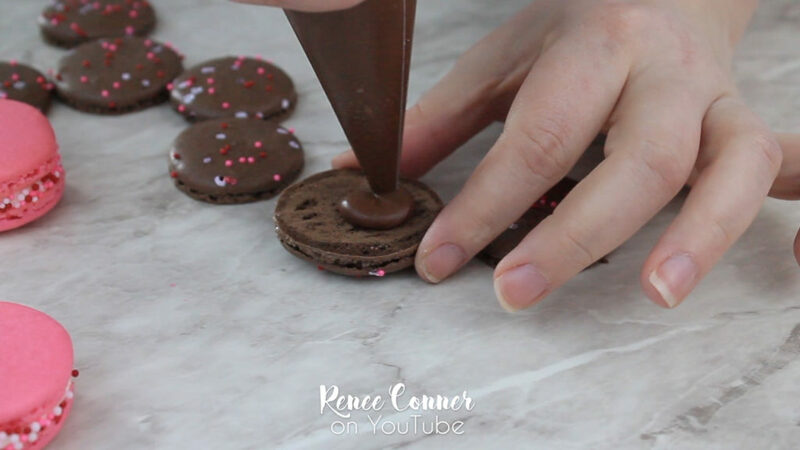 Scroll down to watch my full video on YouTube for my tips and tricks towards mastery of these darling little confections! The key to the nice smooth tops is to have super fine almond meal and powdered sugar… Sift the almond meal/flour and discard any bits that are too big to sift through, if it’s under a tablespoon amount you don’t need to worry about the difference in weight. Then sift the powdered sugar as well. If you’re making vanilla French macarons you’ll just whisk these ingredients together and that’s it. 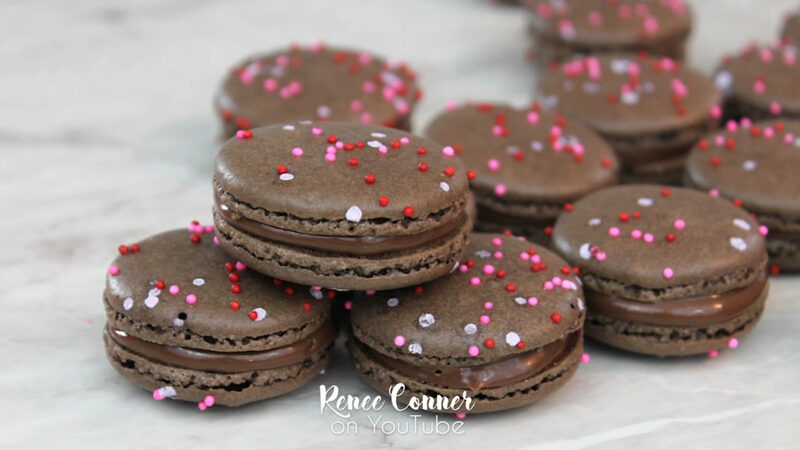 But, if you want to make them chocolate French macarons, just cocoa powder at this stage! The chocolate are DELIOUS! They taste like fudgey brownies, definitely a favorite in my family. You’ll want to just whisk the cocoa powder into the other dry ingredients. 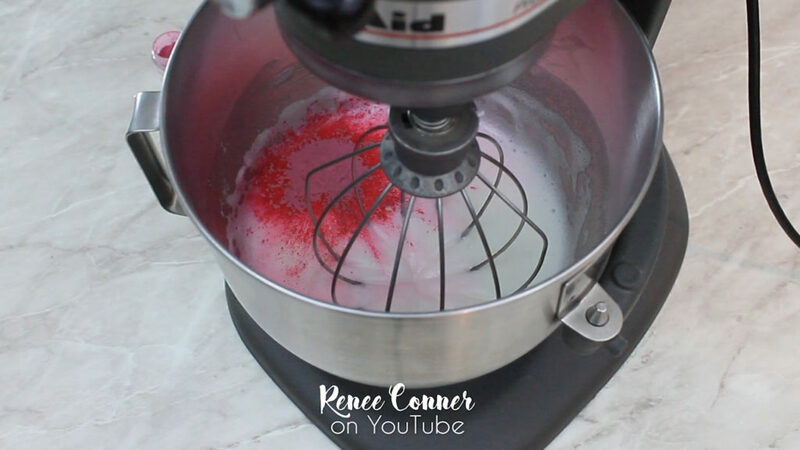 Then, create a delicious, fluffy meringue! 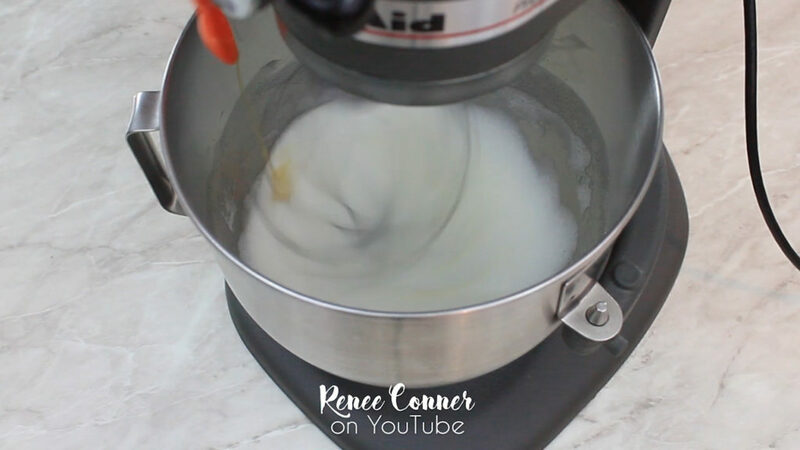 Whip room temperature egg whites. It is best to “age” the egg whites- that is to crack them into a bowl, lightly cover and let them age in the fridge, or on the counter (if that doesn’t freak you out). You’ll want to be sure that if you age your egg whites in the fridge you let them come to room temperature before starting! And coloring if desired, I highly recommend using powdered food coloring, they are super pigmented and don’t add extra moisture so it is easy to get nice vibrant colors. If not using powders, I’d recommend using gel colors. 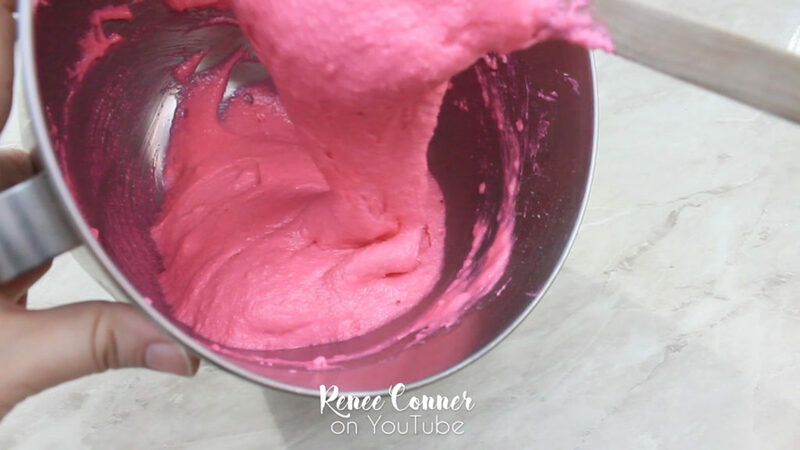 Keep mixing a few more seconds until you form stiff peaks- be sure not to over whip. 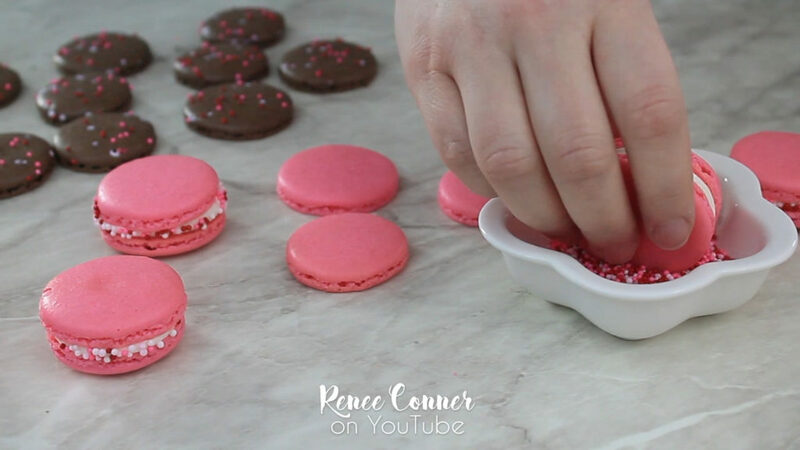 If you whip the egg whites too long they will dry out and can lead to many of the problems people encounter when making French macarons. 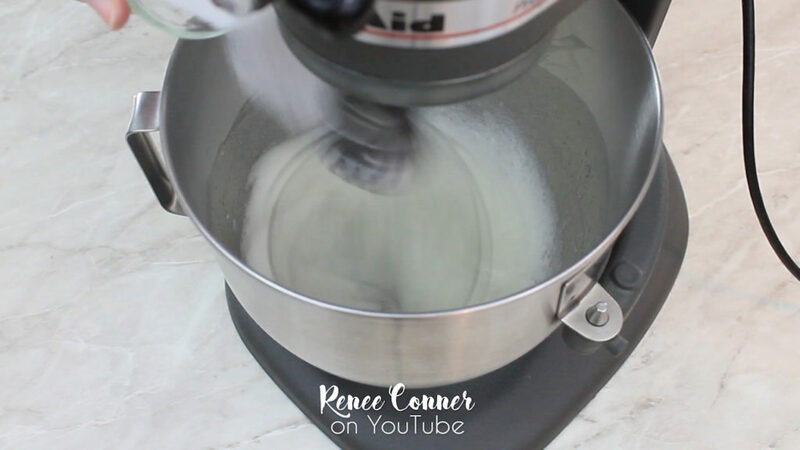 When your meringue is read, add the dry ingredients. Gently fold the mixture until the ingredients are combined, then begin the macronage process- fold and press the batter against the bowl. This will take about 40-50 strokes, but you’ll want to look for the “lava” stage, where the batter slowly drips off the spatula in a ribbon and sits on itself a bit before falling back in. It is very important not to over-mix. 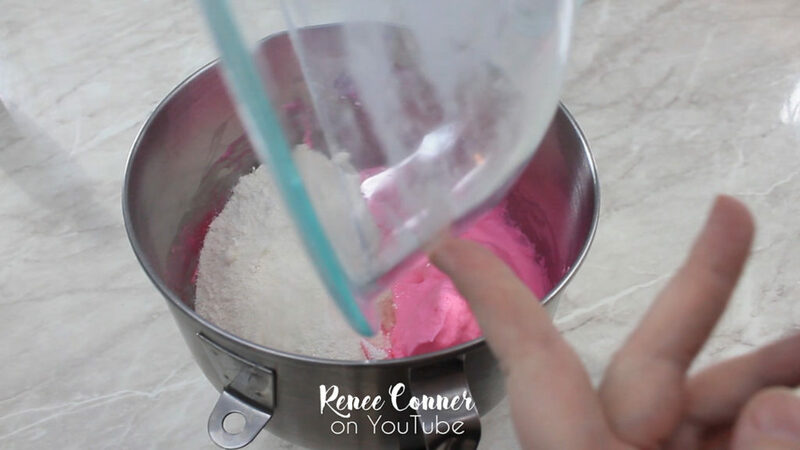 It is better to err on the side of under mixing. Now it’s time to pipe these beauties out! 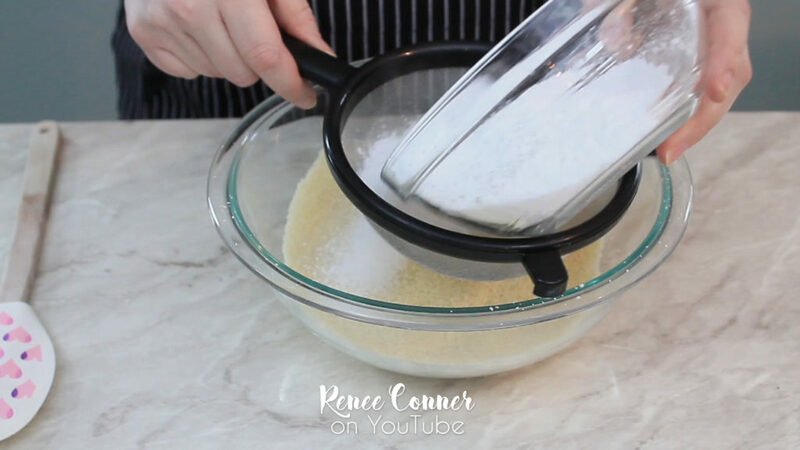 Use a round tip on a parchment lined baking sheet. A bit of batter under the corners will hold it down. You can make them as bit as you want, but the standard size is 1 inch. Leave 1-1 1/2 inches between each, they will spread a bit. Try to make them as uniform in size/shape as possible. Top with sprinkles or embellishments if desired! Applied right after piping and they will easily stick to the surface. 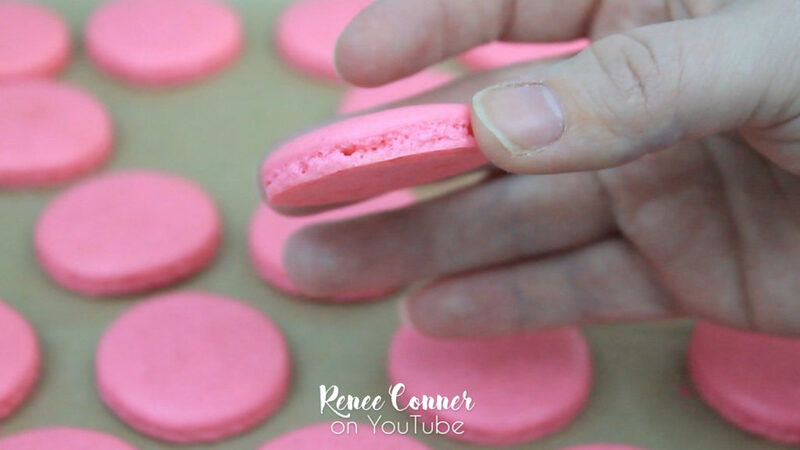 Then, let your french macarons sit for about 30 min (or longer if necessary), until the top skins over. You should be able to gently touch them and they aren’t sticky. Then they are ready for the oven! 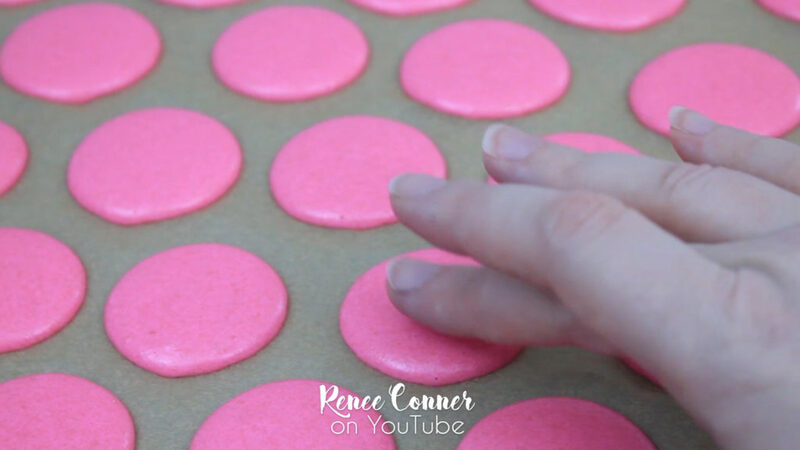 I usually start preheating the oven- to 300°F while I’m letting the piped macarons rest. This way it will be at temp by the time it’s time to bake! For best results, bake one tray at a time in the center of the oven. 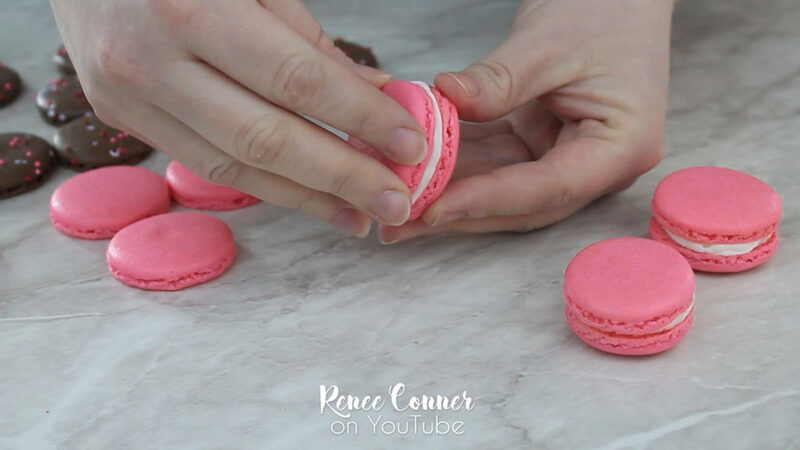 You’ll know they’re ready when you can see they have risen and formed the trademark “feet” of the macaron! They will lift easily from the parchment but shouldn’t develop much if any color. 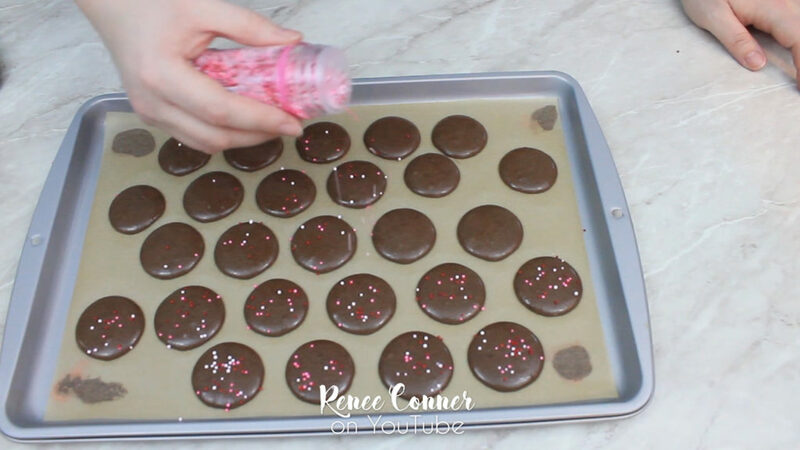 Fill with your favorite fillings and rim with more sprinkles if desired! Enjoy immediately, but they are even better after being “matured” for 24 hours! Serve these to your friends and you are sure to impress them! Delicious little cookies. Super trendy and super easy to make. These come together in no time, with just a few ingredients. They have a delicate crisp outer shell and a delicious chewy interior. Paired with any number of fillings the flavors are only limited by your imagination! *Also optional, sprinkles for topping! Sift almond meal/flour into a medium bowl, discard any chunks that are too large to go through. If it is less than 1 tablespoon’s worth, don’t worry about adding more to make up the difference. 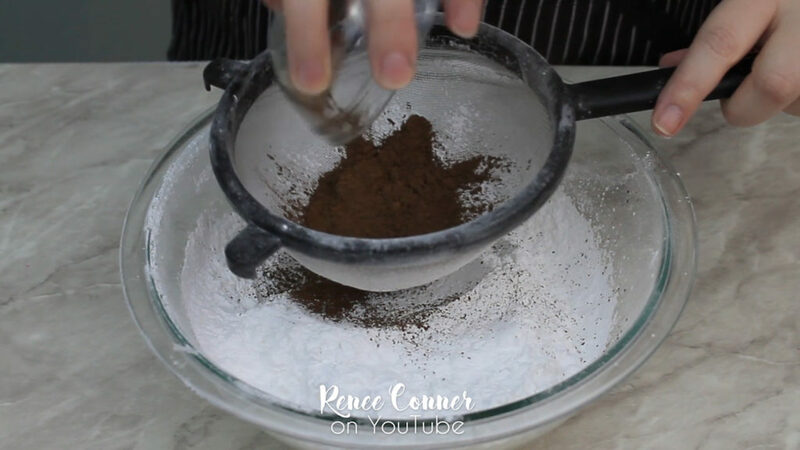 Sift powdered sugar into the bowl with the almond meal. If making the chocolate version, sift in the cocoa powder and whisk to combine. 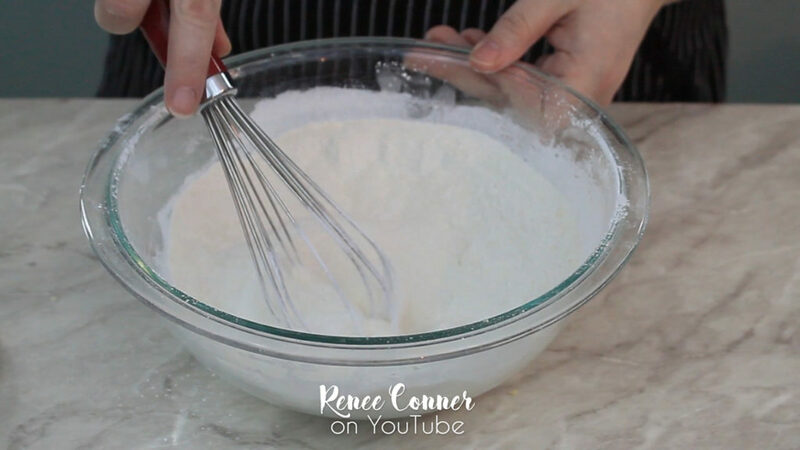 In the bowl of a stand mixer, add egg whites and whip for a few seconds to break up the egg whites. While the mixer is running on med-high, slowly stream in the granulated sugar. Continue to whip on high until a soft meringue forms. Add vanilla extract and coloring. Powdered food coloring is recommended, otherwise use gel colors. Continue whipping on high until stiff peaks form. It will not take much longer, be careful no to over whip. Add dry ingredients to the meringue and gently mix with a spatula to combine. Continue with “macronage” (fold, then press the batter against the bowl) until you get to the “lava” stage. Batter should slowly drip off the spatula in a ribbon and sit on itself before sinking back in. This should take about 40-50 strokes, but be careful not to over mix! Err on the side of under mixing. 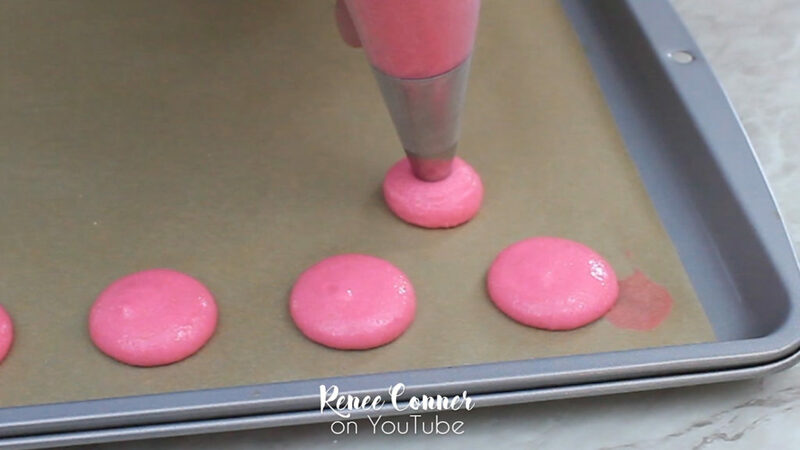 Pour into a pastry bag fitted with a 1/2 in round tip and pipe 1 inch circles onto a parchment lined baking sheet. *a bit of batter under the corner of the parchment will keep it from lifting while you pipe! Space the cookies 1 – 1 1/2 inches apart as they will spread a little. Rap the baking sheet firmly on the counter a few times to pop and bubbles. If desired, add sprinkles to the top. Right after they are piped the top is tacky and the sprinkles will readily stick. Set aside to set for about 30 minutes or until a skin forms. You should be able to gently touch the surface and they should not be sticky. *Preheat the oven to 300°F while they are setting. When they are set, bake in a preheated 300°F oven for about 12-15 min. They should not develop much, if any color, but will rise and form the trademark macron “foot”. They should lift easily from the parchment. 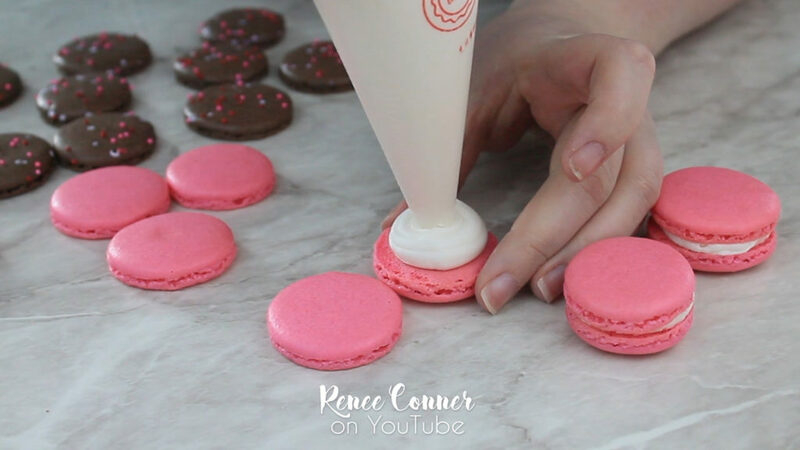 When the macaron shells are cooled completely remove them from the parchment and pipe in your favorite filling! Sandwich the cookies and rim with more sprinkles if desired! 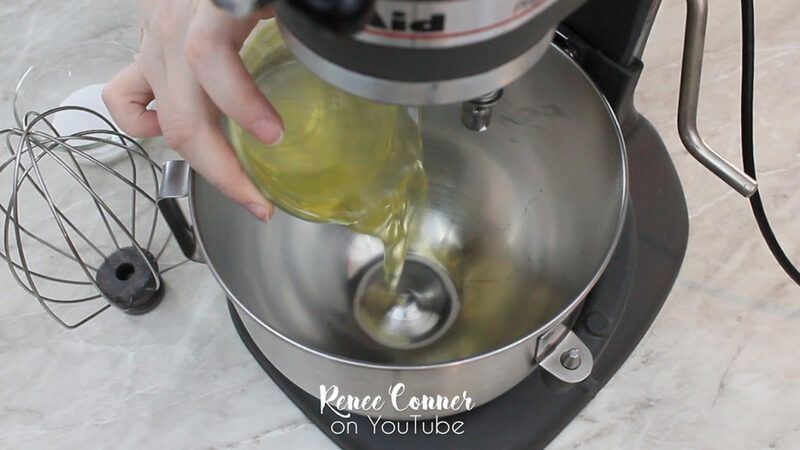 This is a pretty easy recipe, but it make take a few times to get the hang of the right stage at mixing. Practice makes perfect and even cracked shells are delicious! « Gumpaste Sweet Pea	» Wyldstyle Oreos for Lego Movie 2!